Within a few hours of last night’s horrendous Las Vegas Strip massacre, various outlets on the blogosphere had identified the killer. In my New To Las Vegas home just a few miles from the crime scene, I watched on the Internet overnight as they displayed his name, his picture, his hometown–Reno–his age. There was no confirmation of any of this from Las Vegas authorities. The blogosphere outlets, generally of a conservative persuasion, especially had this–the murderer was a supporter of the liberal MSNBC pundit Rachel Maddow and other progressive causes. I presume this connection was intended to diffuse the certain-to-come allegations that right-wing objections to gun control laws had fostered the carnage. Small problem here: The outlets identified the wrong person. Completely and totally. 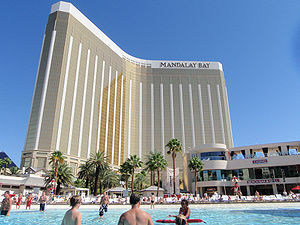 Later in the early hours of today, Clark County Sheriff Joseph Lombardo identified the sole shooter firing across the Strip from the Mandalay Bay Resort and Casino at the Route 91 Harvest Festival as Stephen Paddock, 64, of Mesquite, Nev. That’s a growing retirement community on the Arizona state line 85 miles northeast of Las Vegas. Since then, some of the posts have come down, and others have been updated. But I haven’t seen many apologies. That’s something purveyors of fake news aren’t very good at, even when they’re so conclusively exposed. I won’t name the wrongly identified person here. But I have to think he has a tremendous defamation lawsuit against some of these blogs. If falsely and recklessly being named as the worst mass murderer in U.S. history isn’t defamatory, what is? But any lawsuits largely would be symbolic. I imagine the owners of most of these blogs are judgment-proof because they have little money to go with their little sense of responsibility. From what I can tell, the blogs went awry after Las Vegas authorities said publicly they were looking for one Marilou Danley as a person of interest. Danley had a link to the shooter that the authorities didn’t disclose immediately. Whatever that was–girl friend, perhaps–it turns out she was out of the country last night, had been so for some days, and had no known culpable connection to the tragic events. In my experience, many blogs tend to “pick up” material from similarly inclined blogs without doing much–or anything–in the way of verification or, perish the thought, additional reporting. The wrong identification quickly popped up on other blogs pushing a conservative line: Dailey Alt News (which did later post an apology) and USSA News, a Tea Party organ. Sites with less focused political identities, like Everipedia, also fingered the wrong person. The blogosphere is a big space, but I haven’t seen the wrong ID on prominent liberal blogs. For those that named the wrong guy, there didn’t seem to be a lot of good faith effort. A large part of the blogosphere reminds me of something Mark Twain is said to have opined: Truth is a precious weapon, so use it sparingly.